Charles Randolph-Wright is a highly talented multi-hyphenate -- writer-director-producer-choreographer-actor -- with outstanding credits in both legitimate theater and television. PREACHING TO THE CHOIR is his feature motion picture debut and so it was with considerable anticipation that I purchased the just-released DVD at Circuit City. Promotionally priced at a measly $9.95, I figured this was an exceptional bargain. What I didn't bargain for, however, was my disappointment. Don't get me wrong. 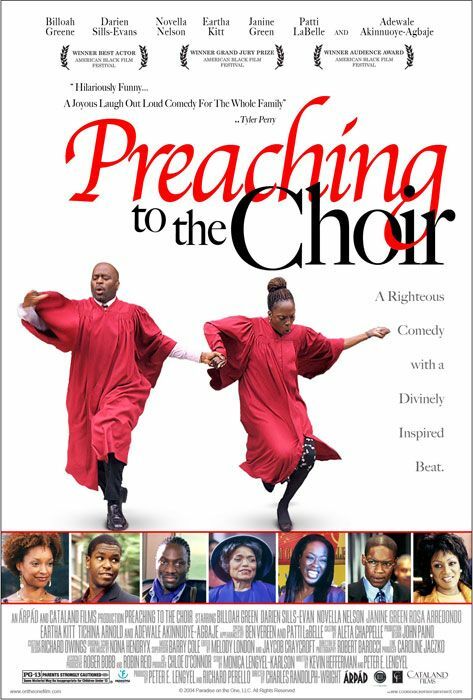 PREACHING TO THE CHOIR is not a bad film -- in fact there are some spirited musical numbers thanks to the original music by Nona Hendryx and a number of winning performances, especially by Denise Burse and Adriane Lenox whose sprightly banter comprise a "Greek Chorus" that virtually steals every scene they are in. There's also Eartha Kitt, looking absolutely marvelous, the incomparable Pattie LaBelle and surprising Tim Reid, who you may not recognize as "The Prophet." It should be no surprise that all three of these experienced veterans contribute considerable talent and screen charisma. In fact, some of the younger actors deserve a brief mention as well -- Rosa Arredondo and Janine Green are the first of several that come to mind. And, of course, there's the uncredited bit part played by Liza Vann (as one of the gospel competition judges) who steals a three-second scene -- and does so without saying a word. Unfortunately, the film's paint-by-the-numbers, formulaic screenplay neutralizes much of the inherent good intentions where traditional values, faith and family triumph over fleeting fame, blasphemy and bling. 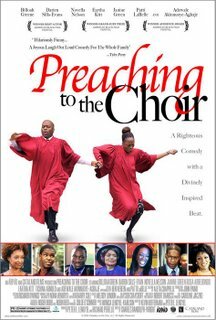 Perhaps even more damaging is the surprising lack of energy and pace, even in some of the featured gospel scenes. While the film may have plenty of heart, from my perspective it beats too slowly and too quietly (thanks to a dreadful sound mix) to give it more than two hallelujahs out of a possible four. In the final analysis PREACHING TO THE CHOIR will be well-liked by those pre-disposed to the subject matter and the message -- just what one would anticipate from the title itself. When you think about it this way, what more should I have expected?